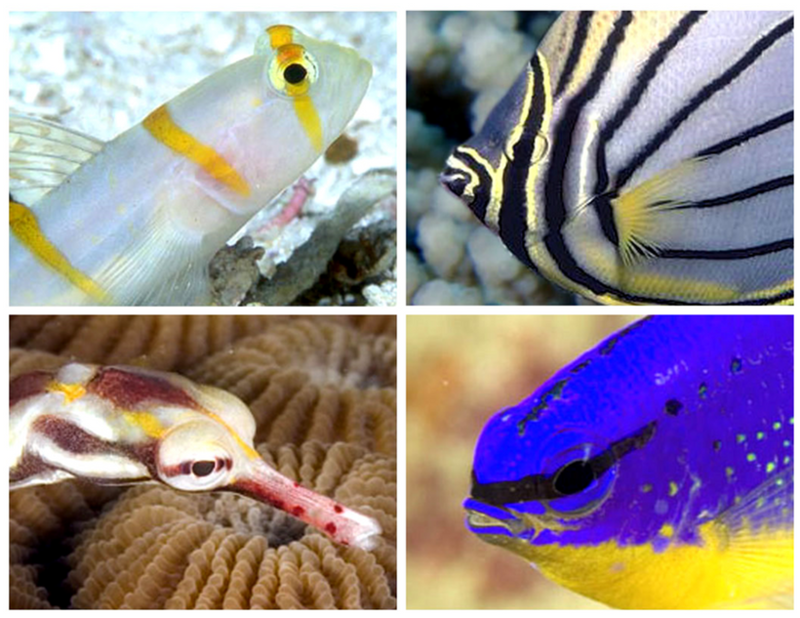 A peculiar phenomenon found in many unrelated species of coral reef fish is the presence of colored bands extending through the eyes, which match the corresponding colored skin patterns. This presents an enormous problem for gradualistic evolution, given the fact that skin color and eye color are controlled by different sets of genetic instruction. Nevertheless, proponents of evolution believe that if they can contrive a survival function, regardless of how far-fetched, that evolution will work its miracles over millions of years. 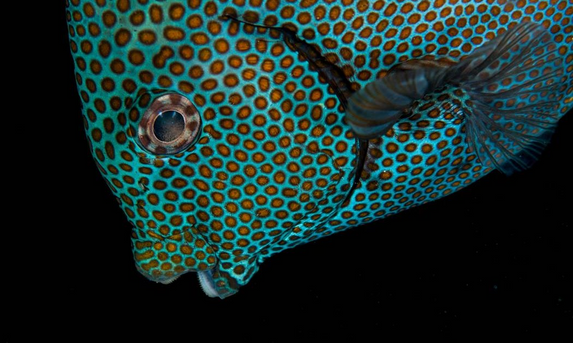 The consensus today among marine biologists is that this coloration in the eye represents "eye camouflage". it is believed that it confuses predators. Close examination of this proposal is fraught with problems. 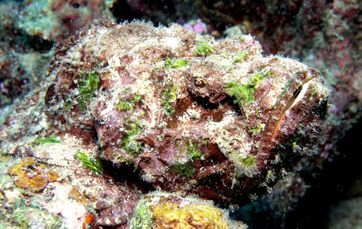 The stonefish (left) is endowed with camouflage such that it blends in with the surrounding rocks. 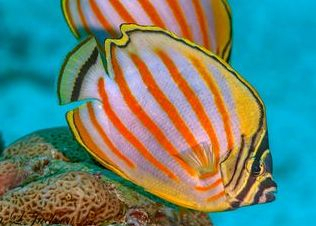 The ornate butterflyfish (right) stands out like a fishing lure. Nevertheless, proponents of evolution believe that the composite stripe through the eye confuses predators through camouflage. Regardless of the angle at which the skin stripe approaches the eye, the stripe is repeated in the eye itself, perfectly transecting the pupil. Had evolution produced "eye camouflage", the pattern would be random. Another element of creative design that is largely unnoticed is that the stripes have a predilection to transverse the pupil squarely. Why would skin stripes be so positioned so as to allow the pattern that is repeated in the eye to perfectly transect the pupil? 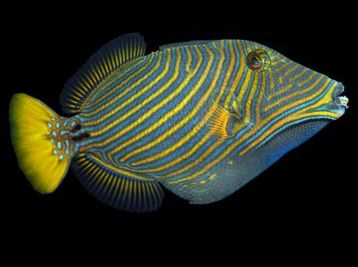 In this surgeonfish, note that each colored spot is bordered by a darker edge. What possible evolutionary "purpose" could there be to repeat the pattern of skin spots in the eye of this surgeonfish? Although some might dismiss these observations as trivial details, they are manifestations of order. If it is proposed that these designs were created as the result of mutations, a scientific explanation is required. Another interesting phenomenon is the convergence of the skin pattern in a radial fashion around the eye, such that the pattern is repeated in the eye, all converging on the pupil. 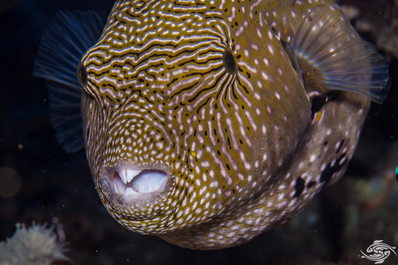 This is noted prominently in the map puffer (left), and undulate triggerfish (right). It remains impossible to explain why evolution would produce color patterns in the skin that would be so positioned such that identical patterns would be repeated in the eyes to converge on the pupils. Evolutionists have become so accustomed to storytelling, that they have convinced themselves that if they can contrive a function, that natural selection can create it, regardless of how improbable. The first problem with "eye camouflage" is that the "function" imagined by biologists doesn't make sense. The most obvious predator is the shark. However, they are colorblind. The moray eel, another predator, has very poor eyesight and relies almost exclusively on smell to locate its prey. Both the shark and the moray eel feed almost exclusively at night. 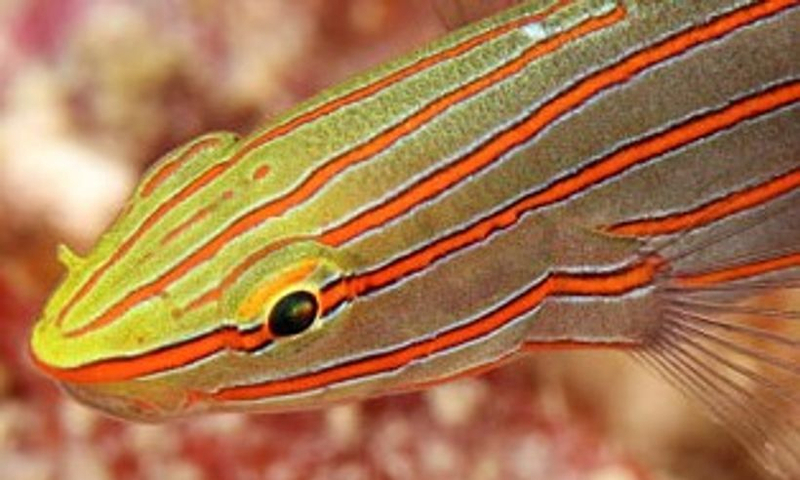 Other larger predatory fish are also colorblind. Furthermore, the notion that crossbars in eyes confuse predators is founded solely on imagination. There is no objective evidence that predators are dissuaded by these patterns in the eyes. If one ascribes to the theory of evolution, it must be acknowledged that the colored crossbars in the eyes of multiple species of fishes evolved for no plausible reason. The important thing to understand is that crossbars in the eyes of fishes is a manifestation of order. If order is to be explained through evolution, it has to have a survival function. Even if a survival function can be imagined, the likelihood of mutations resulting in such a precise fit cannot be considered to fall within the reach of possibility.